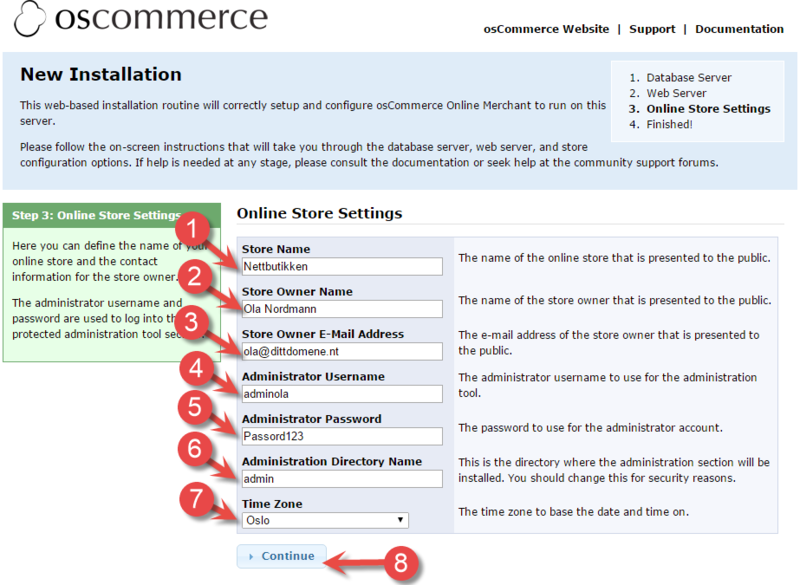 We recommend installing osCommerce automatically from our control panel. Follow the guide here. 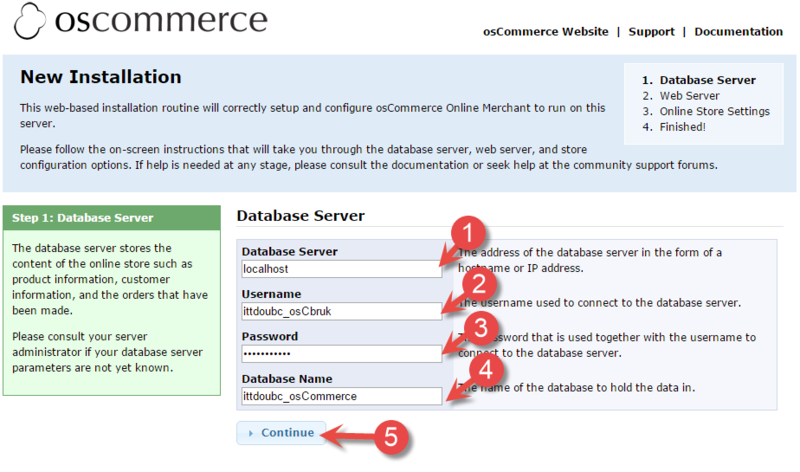 This guide shows how to proceed to install osCommerce manually on our web hosting account. Go to osCommerce's website at https://www.oscommerce.com and download the latest version. The file you downloaded is an archive containing all of osCommerce. Unpack this locally on the computer you are using. osCommerce can be uploaded in several ways. This guide details the simplest way - via FTP. If you are unsure about how to set up an FTP client, you should click on our guide for this in the guide section on our website. In our example we will install osCommerce on the address http://dittdomene.net/oscommerce. Files that are put in the folder public_html/oscommerce will be accessible on the address http://dittdomene.net/oscommerc. If you cannot find the folder public_html you have most likely specified in your FTP client that it should start in that folder. Upload the contents from the folder "/catalog" which is located on your local computer (from the folder you unpacked in) to the web hosting account. Be aware that this might take some time, since there are many files to upload. To use osCommerce you must have a database. 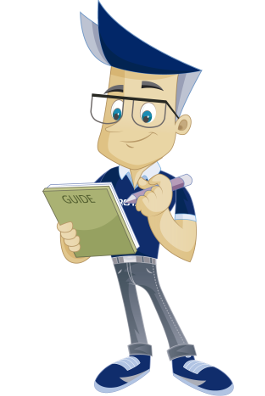 Follow the guide Create MySQL database in cPanel to create a database with associated database user. During the creation we specify "osCommerce" as database name and "osCbruk" as database user in this guide. It gives database name and database username as shown at the top of this guide (all database names and database usernames will have the web hosting account's username as prefix). Go to the address http://dittdomene.net/oscommerce/ in your browser. 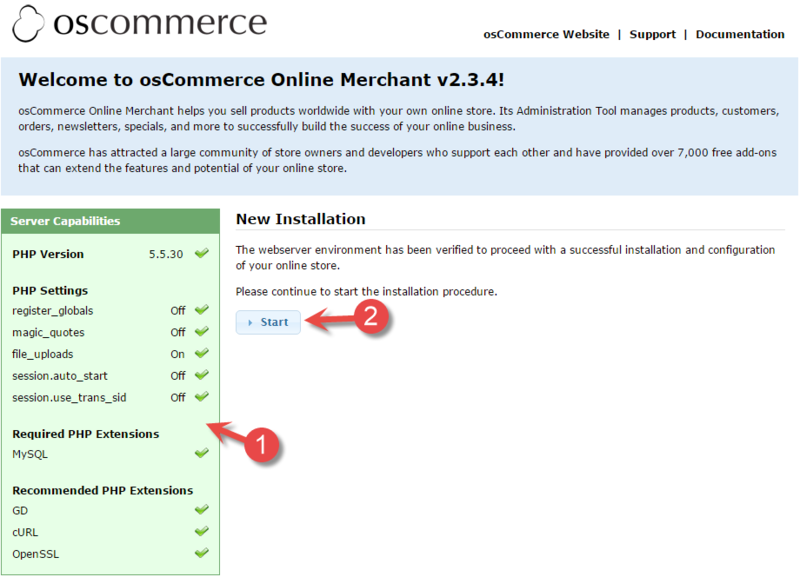 You will automatically receive the installation guide for osCommerce. Check that all the requirements are filled. If you make a mistake somewhere it will most likely be the PHP version/modules you should take a closer look at. This guide can be of help in that case. Click on "Start" to start the installation. Server name should always be "localhost". Specify the database user's password, which you set when you created the database. Click "Continue" to move on to the next step. Check that the address for your osCommerce is correct. 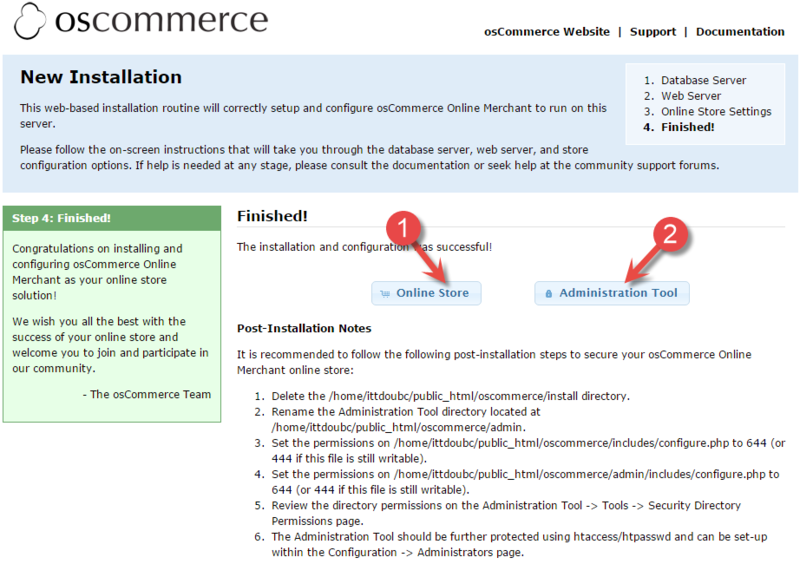 Check that the root folder for your osCommerce installation is correct. Specify name for the online store (can be changed later). Specify name for owner of the online store. Specify email address for owner of the online store. Specify desired username for administrator for the online store. Specify desired password for administrator for the online store. Choose which folder the administration panel should be installed in. Here you choose admin unless you have specific needs. Click on "Online Store" to go to the online store. Click on "Administration Tool" to go to the login page for the administration panel. Connect via FTP and delete the folder "/install". We have now been through how to install osCommerce on your web hosting account.